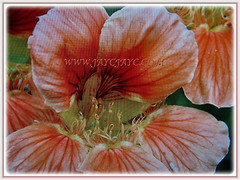 Garden Nasturtium or Indian Cress produces long-lasting and kaleidoscopic flowers as well as attractive foliage that are water lily-like. However, the downside is it self-seeds readily and may pop up in places where they are not wanted. No wonder, this beautiful plant is considered invasive in several areas including Hawaii, coastal California, Lord Howe Island and New Zealand. 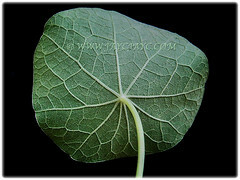 Botanical Name:s Tropaeolum majus (syn. 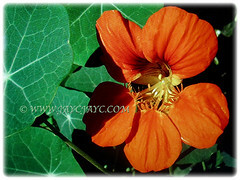 : Nasturtium indicum, Cardamindum majus, Tropaeolum hybridum). Common Names: Nasturtium, Garden Nasturtium, Indian Cress, Monks Cress. Etymology: The genus name Tropaeolum was chosen by the Swedish botanist Carl Linnaeus because the plant reminded him of an ancient custom by Romans and the plant’s round leaves reminded him of shields and its flowers of blood-stained helmets. 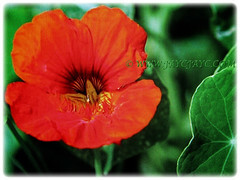 Nasturtium was given because it produces an oil similar to that of Watercress (Nasturtium officinale). Its other common name Indian Cress refers to its cultivation in India. Origin: Native to the Andes from Bolivia north to Columbia. Plant type: A herbaceous annual flowering plant. Features: Tropaeolum is from the genus Tropaeolum that comprises of roughly 80 species of annual and perennial herbaceous flowering plants. There are several dozen of cultivars in the horticultural trade. It is a fast-growing herbaceous annual plant with trailing stems and grows to 1 m long or more. Its 3-15 cm diameter leaves are large and nearly circular, green to glaucous green above, paler below. They are peltate with the 5-30 cm long petiole near the middle of the leaf and have several veins radiating to the smoothly rounded or slightly lobed margin. The flowers are 2.5-6 cm diameter with five petals, eight stamens and a 2.5-3 cm long nectar spur at the rear. Flowers come in shades of yellow, orange, pink, red and even bicoloured, frilled and often darker at the base of the petals. Each fruit is 2 cm broad, three-segmented and each segment contains a single large seed 1-1.5 cm long. 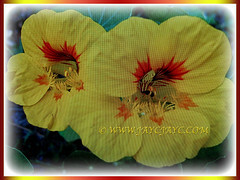 There are 2 main forms of Nasturtiums, namely the dwarf variety that grows up to 38 cm tall and climbing variety that grows up to 2.44 m tall on fences or other structures. 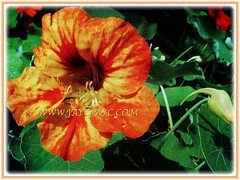 Culture (Care): Tropaeolum majus or Garden Nasturtium grows easily with least maintenance. Moisture: Moderate water requirements. Water regularly and thoroughly until new plants are well established, after which time Nasturtiums are very drought tolerant. Soil: They will tolerate a wide range of soil conditions as long as it is well draining but they prefer sandy and moderately fertile soil mixes. Others: Cutting of the faded and dead flowers will prolong blooming. 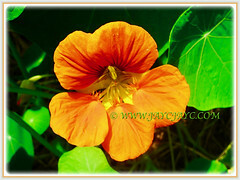 Do not overfertilise Nasturtium plants as too much nitrogen will produce lush foliage at the expense of flowers. Growing them in fertile soil will produce fewer blooms and more foliage. Poorer soils is preferred as fertilising is not needed. They resent transplanting. Generally free from serious diseases and pests. However, watch out for aphids, flea beetles, slugs and the caterpillars of Cabbage White Butterfly. 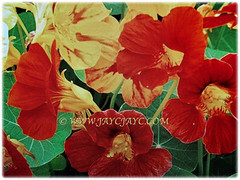 Tropaeolum majus or Garden Nasturtium are most commonly grown as an annual plant in zones 8-11. It may survive very light frosts but they are easily damaged by freezing temperatures. Nasturtiums are very easily grown from seed but they resent transplanting, so it is best to sow the seeds directly in the garden as soon as all danger of frost has passed. If you intend to start your seeds indoors, plant them in pots which can be moved into the garden without disturbing the roots. Sow seeds directly into the garden in warm areas from spring to early autumn but in cold areas sow in spring only. Seeds will germinate in 1-2 weeks and plants start to flower in 10-12 weeks from sowing. Do not overfertilise as too much nitrogen will produce lush foliage at the expense of flowers. Flowering will commence from early summer through fall in cooler climates. Pick flowers regularly to prolong the flowering period. Propagation: Easily propagated from seeds that will germinate in 7-12 days. Alternatively, it can be propagated with basil cuttings but this method tends to take longer than starting new plants from seed. 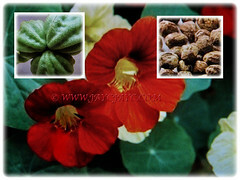 Usage: Tropaeolum majus or Garden Nasturtium is widely cultivated for its edible flowers and leaves that taste peppery as well as immature green seed pods. 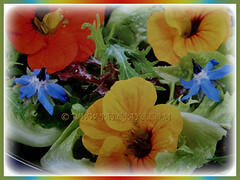 All colours and varieties are tasty when added to salads, sandwiches or as garnishes and even stir fried. Besides, they contain up to 45 mg of lutein per 100 gram which is the highest amount found in any edible plant. The unripe seed pods can be harvested and dropped into spiced vinegar to produce a condiment and garnish, sometimes used in place of capers. They are widely considered as useful companion plants since they repel a great many cucurbit pests such as squash bugs, cucumber beetles and several caterpillars. They also serve as a trap crop against black fly aphids. Besides being grown as an ornamental for its colourful flowers, they’re planted as a medicinal plant. 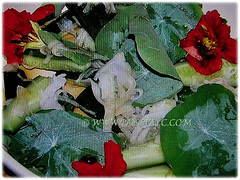 The foliage is rich in vitamin C and the plant also has diuretic and antibacterial properties. The plant is also used to treat wounds and infections of the urinary tract and for problems associated with the respiratory tract such as bronchitis and flu. They also attract beneficial predatory insects. Ideal as groundcover, in containers, hanging baskets, window boxes or massed display along fences.